ST. CLOUD — A man has been charged with two felony counts of making terroristic threats in connection with a bomb threat to St. Cloud City Hall on Wednesday. 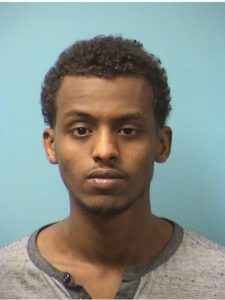 Abdalle Ahmed Ege, 25, was taken into custody Wednesday afternoon after allegedly making a bomb threat on Facebook, according to a Stearns County criminal complaint. Ege claimed he believed he was being radicalized and posted the threat on Facebook to garner the attention of the FBI. St. Cloud law enforcement was advised of a bomb threat to city hall at approximately 10:13 a.m. Wednesday, according to the complaint. A Facebook post allegedly made by Ege indicated he was “bouta bomb this town” and a bag had been placed at city hall. A bag was located outside city hall, next to a gas can, containing personal property belonging to Ege, according to the complaint. The bag did not contain any explosive material. Ege was questioned after being taken into custody and admitted to posting the bomb threat on Facebook and placing the duffle bag at city hall, according to the complaint. He also denied that there were any explosives in the bag….